The Pingback URL has changed as of version 1.0.1! Please make sure your project has correct URL if you are updating from version 1.0! This buyCRED gateway requires you to have a website that has been approved by Paymentwall! Until your website is approved, widgets will only render in test mode. Once you have installed and enabled the plugin on your website, the Paymentwall gateway will become available on the Payment Gateways page in the myCRED menu. Here we need to start by entering in our Paymentwall account details and save. Unzip and upload the mycred-paymentwall folder to your plugins folder. Enable the buyCRED Paymentwall plugin in your WordPress admin area. Click on the “Paymentwall” title to show the gateway settings. Enter your Project API keys and widget ID. Enter an email address and the refund template for when Paymentwall retracts points from a user. This usually only occurs via fraudulent payments. Add the mycred_paymentwall shortcode where you want users to be able to buy points. To render the appropriate Paymentwall widget to let users earn points, you must use the custom mycred_paymentwall shortcode. You can adjust the widgets height and width along with letting users earn points for someone else. This custom gateway does not support the buyCRED purchase shortcodes: mycred_buy or mycred_buy_form! Your Paymentwall Projects Pingback URL must be set to the URL you are shown in your Payment Gateway settings in myCRED. Your Paymentwall Projects Pingback type must be set to URL and not email. 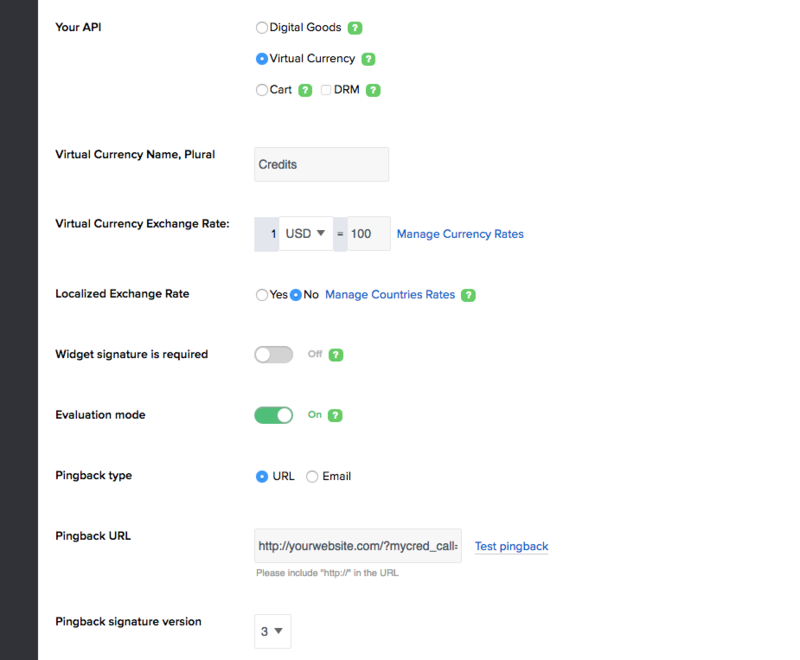 Your Paymentwall Projects Pingback signature version must be set to version 2 or 3 (3 recommended). You can set your Paymentwall widget to allow users to purchase points instead of just earning them. You can use your Points settings in your Paymentwall widget to set just one generic exchange rate or setup point purchase options. Once a user makes a purchase, the add-on will automatically credit their account with the amount they purchased. As of version 1.0.1, this gateway supports Sandbox Mode. While in sandbox mode, you can test to use a Paymentwall widget. If your website is not yet approved, the widget will automatically default to Sandbox mode. If you can not see the Sandbox Mode checkbox in the gateway settings after updating to 1.0.1, click and save your settings (even if you make no changes) and the checkbox should appear.